Master of Business Administration (MBA) at UNITAR international University, Sabah Regional Centre or UNITAR Sarawak Regional Centre is designed to equip students with the knowledge on business management skills and methodology in the field of Business. In the effort to achieve a fully developed country, the university is developing human capital to move towards higher level skills for growth. The aim of the programme is in line with national strategic directions towards knowledge and innovative society. This programme is the pathway for students in management or business. The graduates from this programme are able to serve in diverse business sectors. * Professional qualification from professional bodies equivalent with bachelor degree (honours) recognised by the Malaysian Government. International students must possess the following minimum English Language proficiency requirement before being allowed to register for Faculty courses as listed in the respective programme structures: TOEFL score of 550 or IELTS band 6.
ii) Investment Management. Corporate Finance. International Finance. Services Marketing. Customer Relationship Management. Integrated Marketing Communications. Creativity and Innovation in Business. New Business Venture Management. a. UNITAR Sabah Regional Centre. 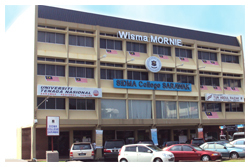 b. UNITAR Sarawak Regional Centre. Tel: 088 – 732 000 or 088 – 732 020.